There are a couple pithy and pseudo-motivational slogans we've all heard, including "You have only one chance to make a first impression" and "If you think you can or think you can't, you're right." When I conduct business development workshops for lawyers or consultative sales training for legal vendor sales teams, one theme I reinforce is, "If you act as if you have one chance to make a sale, you're right." If you treat a client visit, or worse, a prospective client visit, as an opportunity to describe all that's wonderful about you, talking endlessly about all the services you offer and engaging in rapid-fire cross examination-style questioning designed to uncover the opportunity you can pounce on, and you do so because you may never get the opportunity to pitch this person again, then your fear will become reality and you won't be invited back. There are numerous examples of a well-intentioned visit going poorly. Lawyers often feel uncomfortable engaging in small talk, and since they're most accustomed to being consulted after a problem has surfaced, they often flounder in prospect meetings when there isn't a specific issue to discuss. Rather than use the opportunity to gather information about the prospect's business strategy and competitive challenges, they fall back to speaking about their practice areas, or their firm's many capabilities. 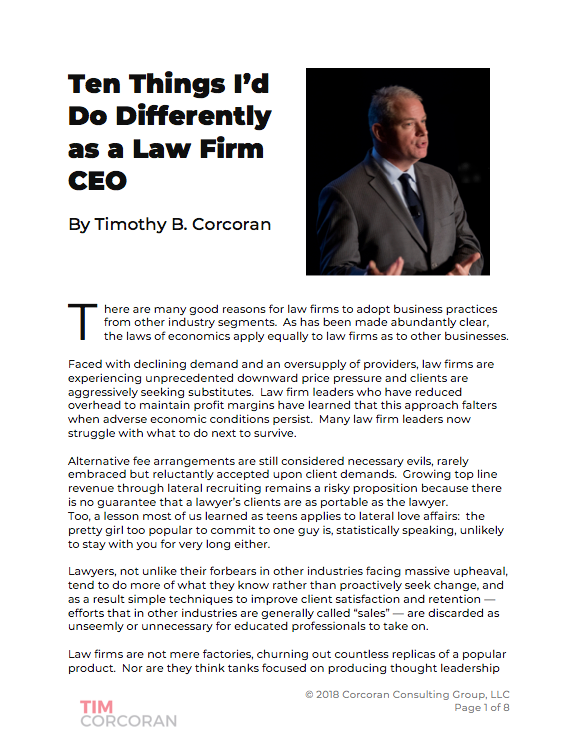 The legal marketing community, of which I'm a proud member, often exacerbates this situation by perpetuating the myth that brochures, capabilities statements, lengthy lawyer biographies, deal lists and league tables are necessary components to win an engagement, when nearly every reputable client survey points out that clients hire experts who understand their business. Credentials matter, of course, but as one in-house counsel said to me, "You won't get in my office if there isn't sufficient evidence that you're an expert in the field. So once you're in front of me, repeating your credentials is a waste of time. I need to know that you understand my issues, not your own skills." Lest we pick on lawyers, understand that this bad habit plays out every day in corporate sales forces. Some years ago my small division was asked to collaborate with a separate division, since we both called on the same clients albeit offering very different products and services. Our sales approach, reinforced through rigorous training by Bill Flannery of the WJF Institute, among others, was to use an initial meeting to gain insights into the client's or prospect's business, and we'd later analyze this information to determine how, if at all, our product solutions addressed their needs. Where there was a match, we'd create a custom proposal that replayed the business challenges, quantified the impact of not acting, and demonstrated how our solutions would help address the situation. By design, this required multiple meetings, often with several client stakeholders, before we could assume enough knowledge to understand their challenges, let along deign to offer advice on how to help. This process fell apart when we joined forces with our colleagues. Because they offered a complex and multi-dimensional technology product that nearly every client in our market segment used at one time or another, it was reasonable to assume that they offered something for everyone. This made them lazy. Rather than ask the prospective client what they needed, they resorted to telling anyone who'd listen all that they offered. As one of their senior sales executives explained to me, as if I were slow to grasp the nuanced strategy, "If we take too much time asking questions, that's less time we have to show our product. If we can't quickly find a fit, then we won't be invited back." As if to punctuate the point, that sales team had a wide array of mugs, stress balls, pens and other logo-emblazoned tchotchkes that they presented at every meeting, presumably in the hopes that even outside the clutches of the sales team, prospective clients would be subliminally nudged into buying the products. Selling can be difficult. It can be even more difficult when, like many lawyers do, we pretend that we're not selling. I understand that, for many professionals, the thought of becoming the stereotypical smarmy salesperson is not palatable. But replacing professional consultative selling with talking about ourselves isn't effective either. If your business isn't growing at the rate you'd like, learn how to sell in a consultative manner. If you aren't sure how to do this, start by reading a book or two (here and here). Engage a coach or professional trainer. But if you do nothing else, when sitting across from a potential client and you're not sure what to say to convince them to hire you or buy your product, resist the temptation to talk about yourself or your products. Instead, ask some questions to understand their business challenges. You may find there's not a fit. You may find there is a fit. You won't know until you ask. But what you will assuredly find is that clients tend to invite you back if they believe you're there to help them, not to sell them.